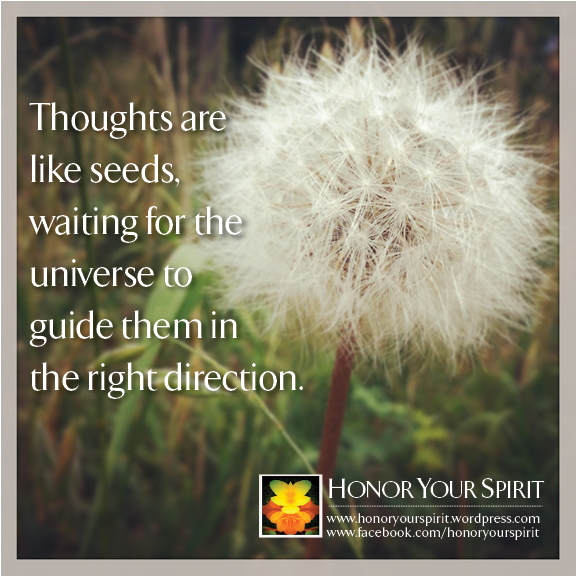 Can you hear it when the universe speaks to you? The mid-air collision looked fatal. I was watching one of the most spectacular air shows I’ve ever seen and it was taking place just several feet from me on my back deck. These weren’t antique airplanes, dazzling spectators with aerial acrobatics. Instead, I was watching two male hummingbirds, fiercely fighting each other with such bravado that I had to move out of the way several times to keep from getting hit. I grew up around hummingbirds; they are seasonal visitors to Colorado. On occasion, I’ve seen the birds tangle with each other, scaring each other off of the little plastic feeder that hangs under the eaves. With immense speed, they can quickly turn in almost any direction and buzz out of the way or right into each other. These two were a different story. They were after each other and it looked serious. The two would speed toward each other with such force that you could actually hear the impact of their bodies colliding even from inside the house. At times they’d even bounce against the screen door with such force it would rattle the frame. After watching for a while, I went inside to concentrate on some affirmation work when I heard the two causing a ruckus again. I looked up and saw them squared off from about 10 feet apart. They accelerated and headed straight for each other. The impact was instantaneous and the thud was loud as both birds fell to the ground. I ran outside in horror and looked out from the deck. Within seconds, the two emerged from the wildflowers below the window and resumed their fight. I exhaled, feeling good that there were no fatalities. But then my attention was drawn to another scuffle, this one between two squirrels about 15 feet away. The ground assault was as unrelenting as the air attack overhead. The squirrels would tangle, jump at each other in mid-air and wrestle each other to the ground. Their chirping and squeaking was so loud you could hear it throughout the mountain valley below. I watched the two in amazement, stopping only to get out of the way of the fighting birds as they zipped around my head. That’s when I sensed that the universe was trying to tell me something–I just couldn’t understand what. My momentary revelation about the universe quickly vanished when two of my favorite friends stopped by. Right ahead of me in the Aspen tree were four Grey Jays, each looking at me eagerly for a handout of day-old bread. 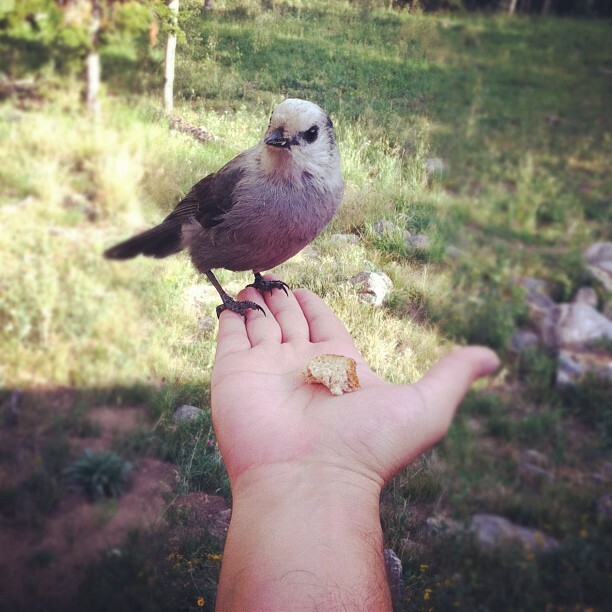 The birds visit me whenever I’m at the mountain retreat and are so well trained I can hold a piece of bread in my hand and they’ll land confidently to pick it up. It’s a small treat for me, which equals a lot of treats for the birds. I look forward to their visits, even if it means frequent trips to the kitchen to get more bread. They circle the house in waves, each waiting for a handout. They’re always pleasant if not persistent but today things were different. A pair of the birds landed on either side of me on the deck railing. As I held out my hand, they both hopped toward me as they always do. But this time, they lunged at each other, signaling that they each wanted the bread for their own. The two flew off and badgered each other in-flight, just as the hummingbirds had done all day. I sat back in my chair and closed my eyes to continue reciting affirmations when I was aware of someone staring at me. I opened my eyes to see the other pair of Jays looking for a handout. Once again, I stood up and extended my hand as one bird flew from the branch above me. Quickly, the other intercepted and fought him off, snatching the bread at the same time. “What the hell is going on today?” I wondered aloud. Once more, I sat down and closed my eyes, determined to get five minutes of affirmation work done without interruption. As soon as I began reciting affirmations in my head, I quickly became aware of all of the fighting going on around me once more. The hummers were at it, the squirrels were at it, and the Jays were at it—everything in the forest seemed to be at odds with each other. The feeling that the universe was speaking to me directly filled my awareness. The events were out of place for a relaxing day in the hills. Taken individually, I wouldn’t have thought twice about the occurrences, but when looking at them wholly, I felt something significant was trying to break through to my consciousness. I slumped down in the chair, feeling frustrated over the affirmation work. This “work” involves purposely giving yourself positive suggestions in areas of your life that you’d like to see some kind of change, however slight. I’ve done affirmation work before and had limited success. The overall goal is to help you change your thoughts by chipping away at negative, ineffective or outdated beliefs. It takes an open mind, concentration and persistence. I had none of the above. My thoughts kept wandering into dangerous territory. I repeatedly found myself thinking, “why isn’t this working?” only to realize that in itself was a limiting statement. I immediately replaced it with another, more positive counterpart. The whole process felt exhausting—and that’s when I finally “heard” what the universe was telling me. Symbolism was all around me, focused into the pairs of animals that were fighting each other. Each of the animals were equals—two hummingbirds, two squirrels and two sets of Grey Jays. Looking at each pair, you’d be hard pressed to tell each of them apart. I realized then the connection to beliefs. Beliefs in and of themselves are neither negative nor positive. It’s only the value we place on them that make them productive or counter-productive to our own development. I spent the better part of the day in a battle with myself, pitting opposing ideas against each other for a place in my deeper consciousness. Every 20 minutes or so, I was purposely “trying” to do affirmations and I realized then—when the universe revealed it to me—that I was trying too hard. I was trying so forcefully to imbue new beliefs into my psyche that I was actually pushing them away with the effort. The animals helped me see it clearly. A smile appeared on my face and I caught myself making it. It was a smile of “knowing” that the universe was on my side and it was telling me to take it easy. Once I relaxed and let the information come to me, it was hard to dismiss. There’s nothing quite as reassuring as the understanding of your own connection to the divine. So I relaxed and sat in appreciation of my new awareness. 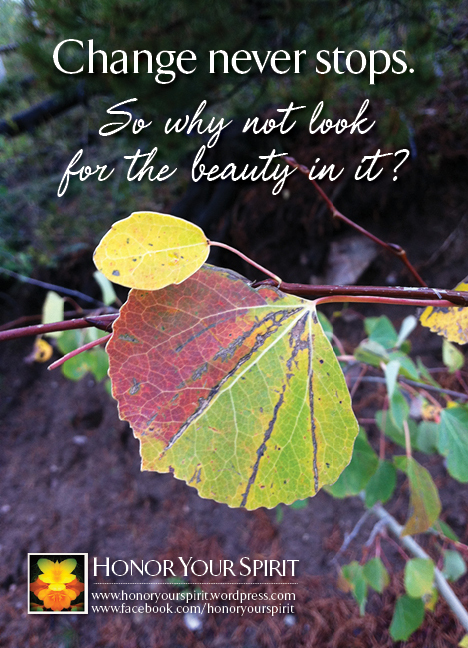 I dropped the affirmation work for the day and instead turned my attention to the sound of the Aspen leaves rustling above my head. I soaked in the atmosphere of the mountain air and breathed deeply and assuredly. One of the Jays plopped out of the sky and landed on the railing in front of me. I grabbed some bread from the table and reached my hand out in a peaceful offering. He flew to my hand and sat on my thumb for several seconds, staring at me deeply before grabbing the food and flying away. As I watched him soar above the meadow, I noticed there were no more fighting squirrels. They were each quietly foraging the ground for their own food, unaware of each other or of the human watching them from above. As I turned to go inside, I glanced at the hummingbird feeder. Each of the males was perched on a separate plastic flower, sipping on the sugary nectar inside. Their differences settled, the two sat and peacefully coexisted. They weren’t fighting anymore and neither was I.